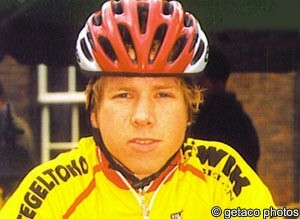 Former professional cyclist, Bart Oegema, passed away on Tuesday according to Wielerland.nl. Oegema, only 27 years old, retired in 2008 from cycling and moved on to a new career in health care. There is no indication as to what the still very young Dutchman died from. Oegema turned professional as a nineteen year old for the division three squad, Cycling Team Bert Story-Piels. After two seasons with the team and few results, Oegema moved to another Dutch outfit, this time, Team Löwik Meubelen-Tegeltoko. Another lackluster year saw Oegema back to the amateur ranks for two seasons and a return to form. He won a stage and took third overall at the Tour de la Martinique, then followed that with a win and a runner-up stage finish at the Circuit des Ardennes, netting him 3rd overall. He followed that with a second place finish in Stage 3 of the Giro del Friuli Venezia Giulia. The still only 24 year old rider was back on form and got a chance to return to the professional ranks in 2008 with P3Transfer-Batavus - the precursor to this year's ProTeam, Vacansoleil-DCM. The year was another wash, and at the end of the season, Oegema called it quits in cycling and moved on to a new career.